This post is for keeping track of comparisons between what publishers/distributors claim in terms of sales (or shipments), and what percentage of that is covered by the available Oricon data. They’ll be listed in alphabetical order, broken down according to however we get the distributor reports. Where we have multiple claimed numbers for different parts of a franchise, I’ve done a total and indented the individual claims underneath. NOTE: Sold numbers will be lower than shipped numbers, so these data points are not all directly comparable, but they will provide good ballparks estimates. Where we have distributors specifically saying sold, it’s been bolded. 300,000 – Claimed (Source, 2007-06), mentioned on the Wikipedia page. Note: Geass R2 and the BD version of R1 were only partially done when this announcement was made, so only titles released through this point were used in the comparison. 1. The 40% (or 47% by units) number is probably very heavily weighted towards mainstream film/TV shows, rather than late night anime. 2. I especially feel like that’s the case because the document at the link you provided (which is interesting, thanks) shows that on BD, the dominant format for late night anime, rentals drop to only 5% (by price, 10% by units). 3. I’m under the impression distributor reports consider rentals and standard retail copies as separate. For example, the TBS document for the K-ON! Movie explicitly separated the two, not counting the 45,000 rental copies in the 226,000 sales number. And purely on the anecdotal side, some people I know who have lived in Japan say that while you can get late night anime at rental stores, it’s a lot less common. Blockbusters like the shows listed in this post would certainly be the ones that get more rental copies on shelves, but probably not to the tune of 20-50% of sales like we see in the gaps above. But in the end, I can’t say anything with 100% certainty. Attack on Titan Vol.1 100,000 copies shipped. Thanks, that’s the first addition I’ve been able to make in a while. Hopefully we find out a full series shipped number at the end as well. An update to Haruhi from the pachinko game advertisements, via ultimatemegax. Previously we had 800k for 2006 + Gekisou. Now we have 1000k for 2006 + 2009, but looks like without Gekisou. I left both data points for completeness, but when calculating the total coverage for the franchise I used the new data point only. The weird discrepancies with very poorly explained sources continue! The only thing this could possibly mean is total units shipped across all volumes, which comes to an average of 6,666. The Oricon average is going to be around 2.0 – 2.1k. It didn’t rank second weeks, and we know Oricon is never the full sales (they don’t cover the Pony Canyon store for example, but it goes beyond that), and we know importers aren’t counted – so it’s a very safe bet the “real” average is easily over 3k, plus whatever it sells in the very long term, a disc here or there over the coming months and years – though you’d think used copies would be what most very late adopters go for. Still quite the gap though. Some of that will be accounted for by unsold stock, obviously. Expect to see Sakura Trick in the discount list at Amazon eventually, like a lot of other series. But nonetheless, this means Pony Canyon was paid for 40k units, whether retailers took a hit on that or whether Oricon is just way under-reporting its sales, who knows? Makes me feel a little better either way. And well, if it does show up heavily discounted in the Amazon bargain bin, I’ll be picking up a few more copies I guess! First new entry in a while! 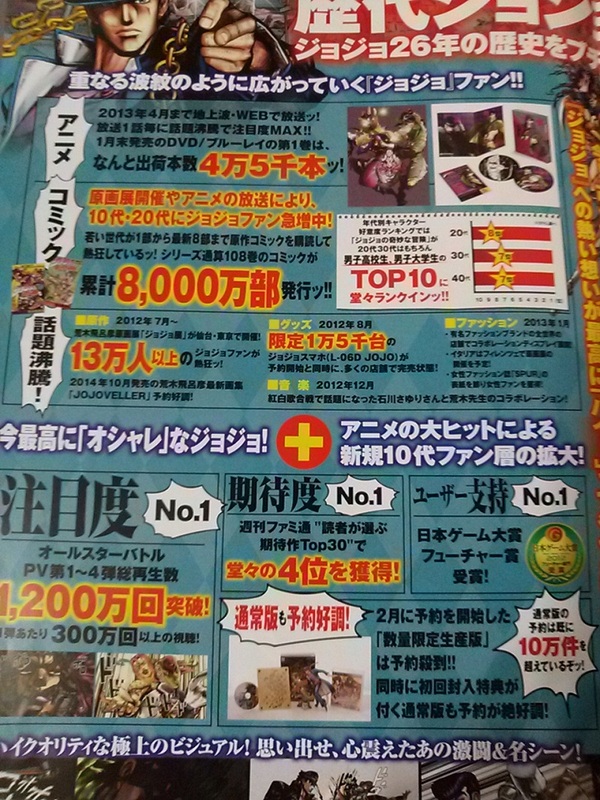 I did a second entry for Shingeki no Kyojin due to this scan popping up, where all the various sales achievements of the Shingeki franchise are touted. We already knew v1 had hit 100k shipped some time ago, and with >80k just through Oricon reports it was a perfectly believable number. Now this scan is saying all volumes shipped over 100k. This gets a bit weirder… that’s Haruhi-levels of coverage, but in 2013-2014, not the dark ages of 2006! And with four volumes around 40k per Oricon you have to wonder where the other 60k went. I’m sure a lot is unsold stock, verrryr long tail, and maybe it includes rental copies too (I don’t think it specifies). But shipped is shipped, and that means that’s how much Pony Canyon got paid for, which is really the number that matters in the end! So Shingeki joins the 100k club, or at least the “distributor reported 100k+ per volume shipped” club. Updated for Non Non Biyori. Some kind of TV spot for the show (I wish I knew more about the source) has claimed that the original manga has shipped 1.2 million units and the DVD/BDs for s1 have shipped 100,000 units. That latter number is virtually double the Oricon reports (52k, average 8,672) and would put the average at 16,666+. This should reinforce the idea that you should never expect Oricon reports to be full sales, although this is an unusually large gap. At this point we should just assume most series have a underestimation of 50% at least. But that is based on (hopefull) speculation on my part. Making it useless. Updated for Monogatari. An Animate article lists 2 million discs sold total across everything pre-Owari. See the post for details, but it’s at about a 73-75% coverage rate now. Would you say that the discrepancy between reported and actually sold numbers tends to narrow as a percentage the higher you get in total sales? So for a lower seller the percentage difference might be larger even though it might not be as many discs as the discrepancy for, for example, Monogatari? Or is there just no trend and basically it can be anywhere from about half to the 80’s regardless of total sales? We only get these shipment numbers for pretty major series (ones worth bragging about), so there’s no way to establish a trend. Especially with so few data points available, and over a relatively long period of time during which Oricon’s reporting coverage has changed. Updated for Free!. Very similar coverage to Monogatari, at roughly 72%. Maybe a bit higher if the number cited was intended to include the live event disc, but it doesn’t say. Yes, shipped is sent to retailers. Thing is, from my understanding, in Japan returns aren’t the scourge to distributors that they are in the US. If a distributor ships (aka is paid for) a copy in Japan, there’s a lot less recourse for retailers to send it back and get a refund later. Thus distributors aren’t eating the cost of refunding returns very often. So the shipped numbers should be a lot closer to what the publisher/distributor were paid for than the Oricon numbers. Especially because Oricon numbers are incomplete to begin with, so they don’t reflect the full “sales to customers” numbers anyway. I was finally able to add something to this post for the first time since November 2015. The Wikipedia page for Aria mentions that as of June 2007 it had sold 300,000 DVDs. That would be after season two had finished releasing but before anything else: no DVD boxes, no Arietta, no Origination, no BD boxes, no Avenirre. That’s just about double the Oricon number of 147,467 (49.2% coverage). I wish we had more of these data points. I haven’t included it in the post yet because we don’t have an Oricon number to compare to, but according to this tweet https://twitter.com/nikkeimj/status/887975586001321985 Touhou’s shipment for Kimi no Na wa is going to be 1.2 million. That account is the Nikkei Marketing Journal, so this should be reliable. Keep in mind that’s the shipment (it’s not even on sale yet), and they’re probably making sure to over-ship at first to ensure it’s available absolutely everywhere. And since that’s the base shipment number, it will include discs that end up going outside of Japan (though not foreign localized releases of course; this is the Japanese release). It’ll take some time to work all of those discs through retail channels, if it does sell out. But it’s really interesting to have the number *before* any Oricon reports. Stalker’s estimate was only a bit over 300k, but Stalker was never intended to handle releases of this magnitude. So like I’ve said, I wouldn’t put too much stock in Stalker’s number here. I’ll probably wait for a few weeks of Oricon numbers before adding it here, because it’s rather unlikely those 1.2 million are all being bought at once. Quite interesting the see that sort of announcement. I still haven’t seen it since I’m waiting for the BD release, but wonder if it has the re-watch value needed to get people to buy it in that sort of number. I could see Stalker’s estimate being right on the money if the value isn’t there for repeated viewings by the general public, unlike more family-friendly Ghibli movies. They wouldn’t ship 1.2 million copies if they only expected 300k sales. I didn’t mean over-shipping -that- much! After all, Stalker guesses Oricon numbers. Oricon could easily miss half of shipped units (either due to insufficient coverage or units going unsold or units shipped internationally). So Stalker can only be right if Oricon reports 300k and in that case that’d be a huge miss by Oricon, significantly bigger than the examples here. Hah yeah I guess I needed an emphasis on IF (and it was a big if lol). As you say, Oricon regularly seems to report 50-70% of sales, so if Stalker says 300k and Oricon reports 500-800k they actually sell 1M…. the 1.2M would be pretty close to ensure ample supply. Plus I’m sure that movie will have quite a tail so having overstock on the shelves for a few months to a year wouldn’t be an issue. This is the Japanese release but as you probably know it has English, Chinese and Japanese subs and the choice of the Japanese or English OST audio tracks; RADWIMPS spent time in the west and both wrote and sung the lyrics in both languages. The English dubbed dialogue is not included. I just wanted to point out that Chinese subs especially could mean a fair percentage get shipped outside of Japan. Do we know if it’s getting any localized releases in major markets near the JP release date? I’m guessing not. So yeah China could be a pretty significant source of sales, considering what a smash hit it was there. Hong Kong will have a same-day release with Chinese and English subtitles and Chinese audio. Ahh, and probably way cheaper than importing, so that should cut down somewhat on how many of those 1.2m end up in China. Assuming mainland can buy the HK release? Dunno what the relationship there is like. Oricon sales were 98,629 for the two boxes (I’m guessing it’s not counting the re-release box set, but no way to know I guess – besides it only sold a few thousand), so about 75.6% coverage vs publisher’s number, which is rather good. Thanks, first thing I’ve been able to add to this list in a while. As was mentioned here, there was an interview with Maeda Toshihiro, a producer at MBS, where he stated that the limited BDs sold at theaters screening the three Washio Sumi films sold about 7,000 each. 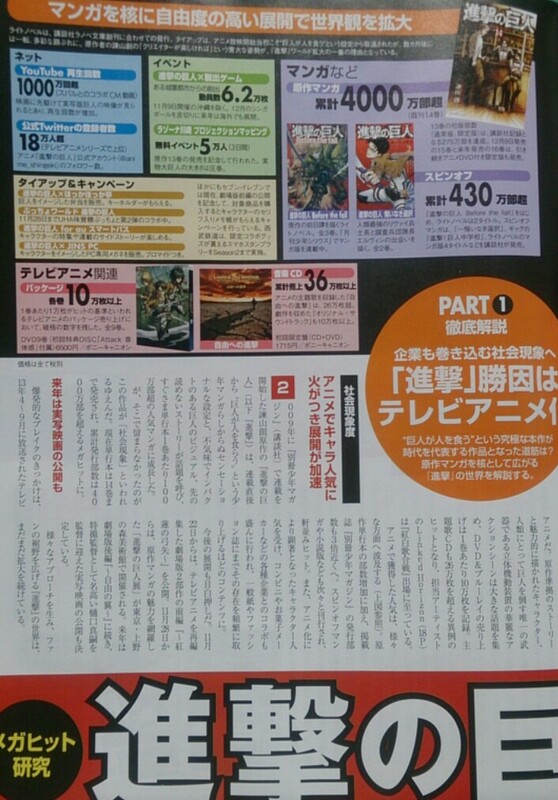 The same material is also being sold in the first volume of the second season (where it was re-cut as 6 weekly episodes), while the second volume is all new material. Since Oricon couldn’t track these it’s not really an Oricon vs Distributor comparison, but it’s interesting enough to make a note of here.